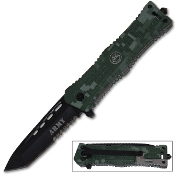 Digital Camo ARMY Tanto Blade Special Ops Pocket Knife Assisted - Razor sharp surgical steel half serrated tanto blade reads, "ARMY". Handy pocket/belt clip. Strong spring assisted technology - Press the index on the back of the handle (or use the thumb stud) to engage the spring, and it "snaps" open and locks in place. Uses a liner locking mechanism that keeps it firmly locked yet allows it to be closed with 1 hand. Quality torx screw construction throughout ensures that this knife won't let you down when you need it. Sure-grip handle contains the Army symbol and reads, "ARMY". The included razor blade seat belt cutter and steel tip window smasher make this a valuable rescue/lifesaving tool.